The control room for the remotely piloted X-56A has a feature that most do not – the pilot and co-pilot are in the front of the room, seen at left. 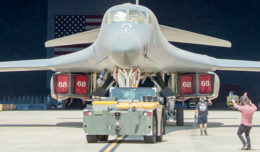 The controllers are essentially two mathematical ways of directing the aircraft in flight and permit the project to advance research on lightweight, more flexible wings. The X-56A aircraft is intended to facilitate the development of tools and technologies and acquire data to validate modeling techniques. The results could enable future airliners to use lighter weight, flexible wing designs to conserve fuel, said Cheng Moua, X-56A project manager. 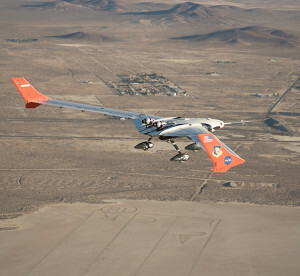 Taking advantage of calm and sunny skies, the X-56 team flew with the modern controller to expand the flight envelope. 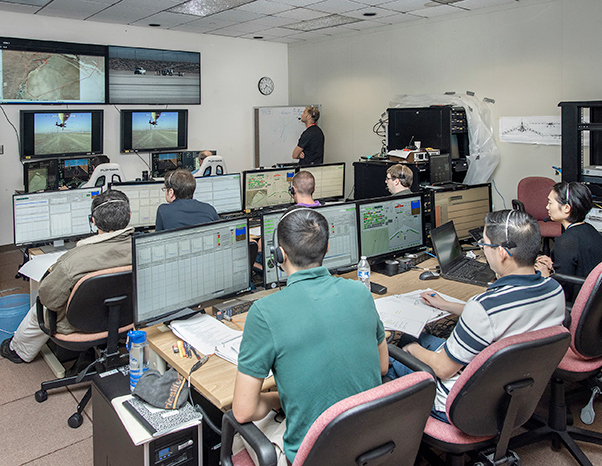 The flight also featured the collection of additional data to improve understanding of the aircraft dynamics at a range of fuel levels with the two controllers. The classical controller is a simpler formulation, which makes it easier to intuitively understand the aircraft behavior and dynamics. The modern controller is more complex and robust. It is expected to permit the aircraft to operate safely at higher speeds, suppressing flutter deeper into the regions where the aircraft is less stable. In an effort to prove the effectiveness of the flutter suppression with the modern controller, researchers planned a sequence of flight maneuvers where the controller was turned off — for less than two seconds at a time as the aircraft approached flutter — allowing the flutter mode to grow uncontrolled. When the system reactivated after a set time, it stabilized the flutter mode and lessened the oscillations. The calm conditions allowed the team to clearly see the aircraft dynamics, as turbulence can make it difficult to determine the cause of a given set of dynamics. The remotely piloted X-56A, which is equipped with highly flexible lightweight wings, flies a research mission. 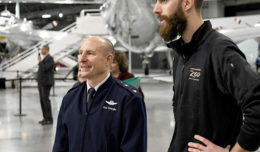 The flight success means Jeffrey Ouellette, an Armstrong dynamics and controls engineer, might soon be able to get the information he needs to refine the aircraft models. For now, the team is happy with the milestones and is ready to reach new ones. The next task will be to fine tune the modern controller, which should allow the X-56A to travel faster with a larger safety margin. Other items for the team are data analysis, model validation and a continuation of technology verification through the end of flights in February. 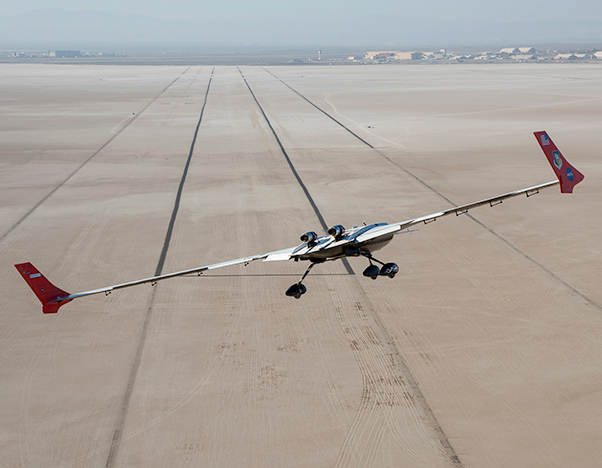 The remotely piloted X-56A concludes a research mission with final approach and landing. One of those technologies the team would like to explore in a potential X-56A follow-on phase is the Fiber Optic Sensing System. It is possible that the system, because it measures the structural response with such high resolution, could be used to not only collect real time data, but use that data in the flight control system. If that happens, it opens the door to simplifying aircraft control and producing even higher performance and more reliable control system designs. A flight Sept. 14 marked the first time the team had suppressed flutter with the classical controller. The flights with the classical controller were intended to allow the team to gather the necessary flight data to precisely determine the open loop flutter speed and understand the dynamics at and beyond flutter onset, before beginning testing with the more complex and less intuitive modern controller. Lockheed Martin developed the X-56A aircraft for the U.S. Air Force Research Laboratory and transferred the aircraft to Armstrong at the conclusion of their flight program. The program is funded through NASA’s Advanced Air Transport Technology project, NASA’s Flight Demonstration Capabilities project and the U.S. Air Force Research Laboratory.